In addition to the new Callaway X2 Hot irons, Callaway have launched the X2 Hot Pro irons, aimed at better players. Compared to the standard X2 Hot irons, the more compact Pro version has less offset, less perimeter weighting and features Callaway's Centre of Gravity (CG) Height Progression offering forgiveness in the long irons and control in the short irons. Made from the same 17-4 stainless steel as the X2 Hot irons, the Pro model features a thinner face that is aided by a stabilizing arch in the back of the clubhead. 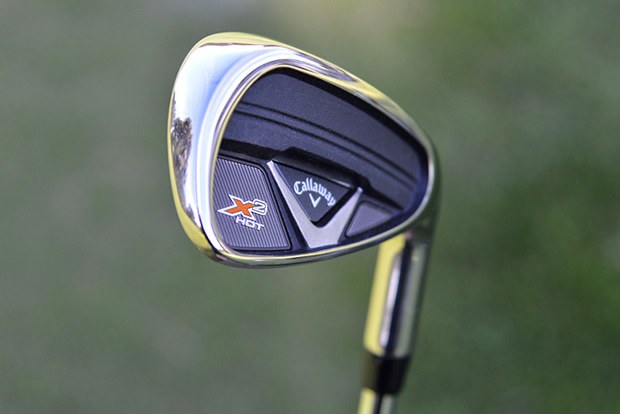 The v-shaped material is actually cast into the back of the clubhead, which Callaway says helps give the irons more consistent ball speeds and removes unwanted flex behind the top of the face, making the X2 Hot Pro irons sound and feel better. 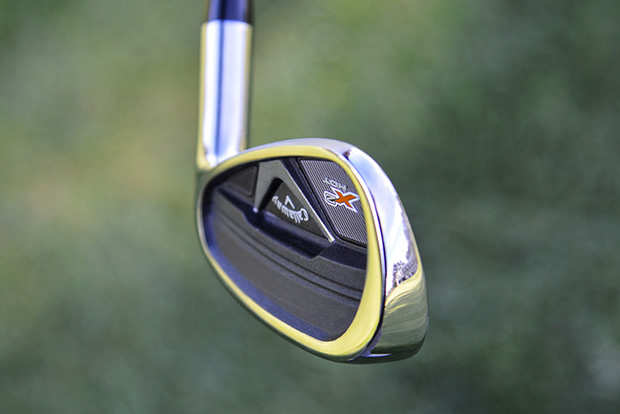 Unlike last year's X Hot Pro iron, the 2014 model doesn't feature an undercut cavity. Instead the X2 Hot Pro features a thinner, shorter face and improved sole giving it a more compact look that is more workable than before. Throughout the set Callaway have altered the amount of offset and CG height to suit each club in the set. There is more offset and a lower CG position in the longer irons, making them more forgiving and easier to launch. Meanwhile the shorter irons have less offset and a higher CG, giving them a clean look whilst making them easier to flight down and control into the green. The X2 Hot Pro irons are cast, unlike the Apex irons or Apex Pro irons which are forged. By using a cast construction, Callaway were able to offer a more affordable set to the game's better players. The RRP of the X2 Hot Pro irons is more than 20% less than the Apex range. One feature the X2 Hot Pro irons do include from the Apex range is the 37WV grooves. Callaway claim the wider spacing of the new groove design makes the irons easier to launch out of the rough.